I was in the heart of my teacup period. This was a few years back. I met up with an old friend Clare, who lives interstate. It turned out she had written a poem about a teapot. 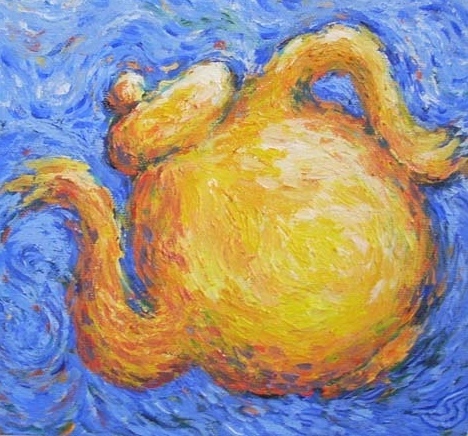 I was immediately inspired to paint a yellow teapot. Recently, Clare spotted my blog serendipitously while googling something else. I reminisce. She and I formed the very first creativity support group in my world. This was wayyy back in the early 90s. The writing branch (she and I) of the support group (she and I) went to a Buddhist wat to conduct a self-styled writers retreat. It was lovely, though what stands out is the wat’s tumultuous and not-at-all-peaceful personal politics. Do you have someone in your life who supports your creativity? A partnership? A group? A coach? A little encouragement goes a long way. And now, in the great big sumptuous circle that is the Creative Love Exchange, I wish to share the teapot poem accompanied by my picture. I post these with full permission of all members of the creativity support group (she and I). and warm abundance in its golden girth. of welcome in the world. 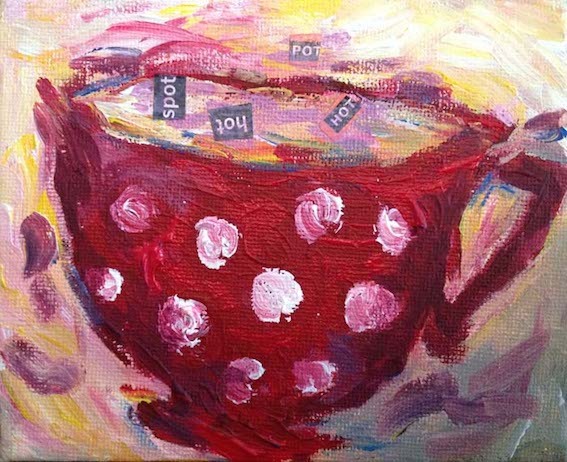 This entry was posted in creative collaboration and tagged art, Creative Love Exchange, inspiration, poetry, teacup, teapot by Art and Soul Space. Bookmark the permalink.